4. The offer is valid on all electronic loads (credit/debit card, net banking, UPI) and is not applicable on cash loads. 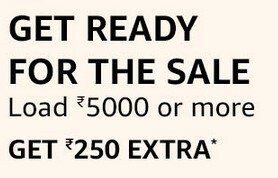 The offer is valid on electronoc loads on Amazon.in app and website only. 6. Note: The maximum permissible limit for monthly Amazon Pay balance load is INR 10,000. You may not be able to Add Amazon Pay balance if this monthly limit is exceeded, upon which you will be ineligible for this offer.